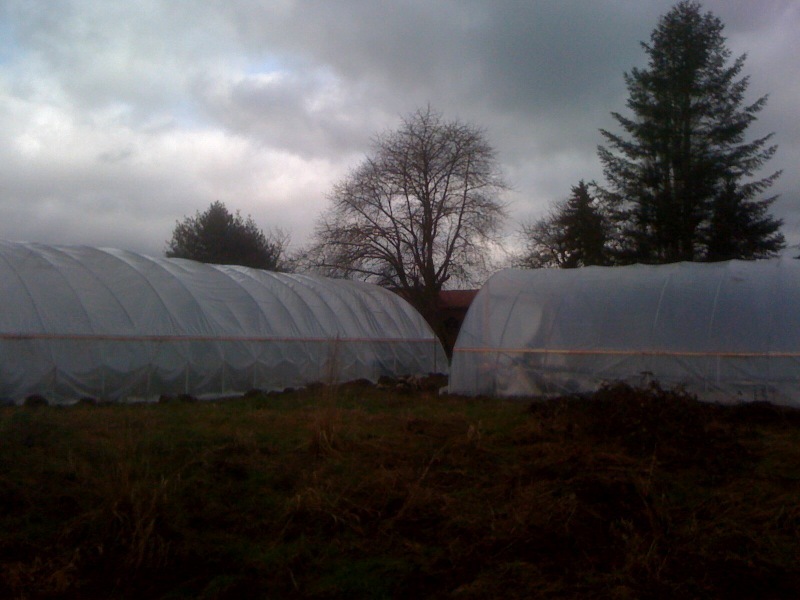 Today, we finished building our second of three 30×90′ greenhouses. These two greenhouses I found used on Craigslist. All of the hoops are slightly to severely bent, the purlins are curved, the swages are squished…. but they are done and relatively plumb and square (for hoop houses). We seeded arugula, radishes, turnips, and bok choy into greenhouse #1 on Monday. 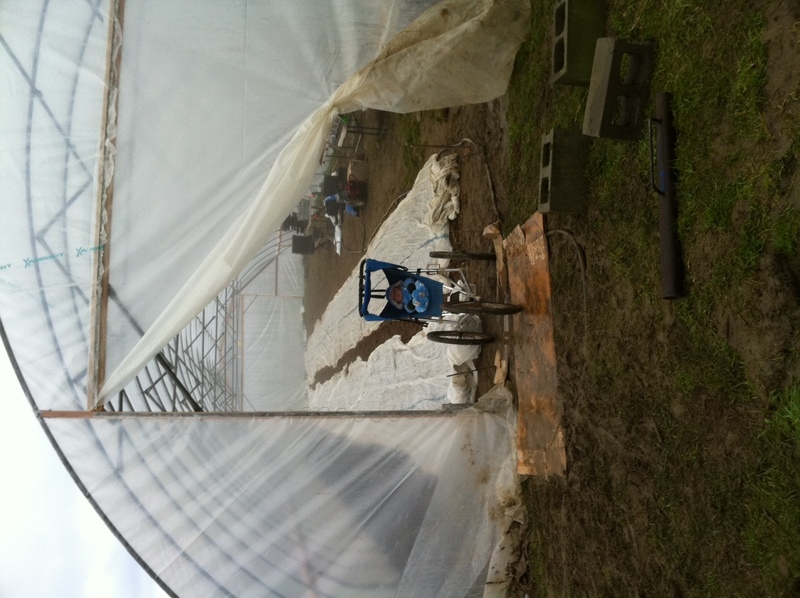 And when we finished greenhouse #2 this afternoon, we moved our seedlings into it from greenhouse #1. Soon, we’ll till the rest of #1, to get it ready for the seedlings now residing in #2. Greenhouses #s 1 & 2, we consider our practice greenhouses. 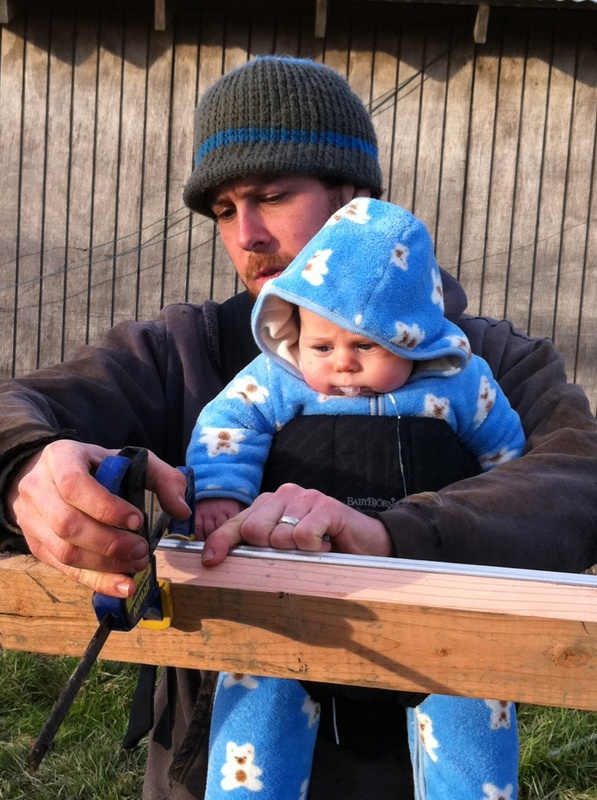 Tomorrow, we begin building the new greenhouse we bought from Steuber’s. It’s also 30×90′, but has a gothic arch roof, instead of a round one. Ultimately, that will be the house in which our seedlings live. The other two will get tomatoes. Yesterday, we had our new 1951 Farmall Cub tractor delivered! Why buy an antique tractor? One of the funny parts about the kind of farming we do is that they don’t make equipment for our sized farm any more. Today, most farms are hundreds, thousands, or dozens of thousands of acres. But back in the ’40s and ’50s, farms and farm equipment were smaller. They also didn’t use as much herbicide, so they had to use their tractors to kill weeds. 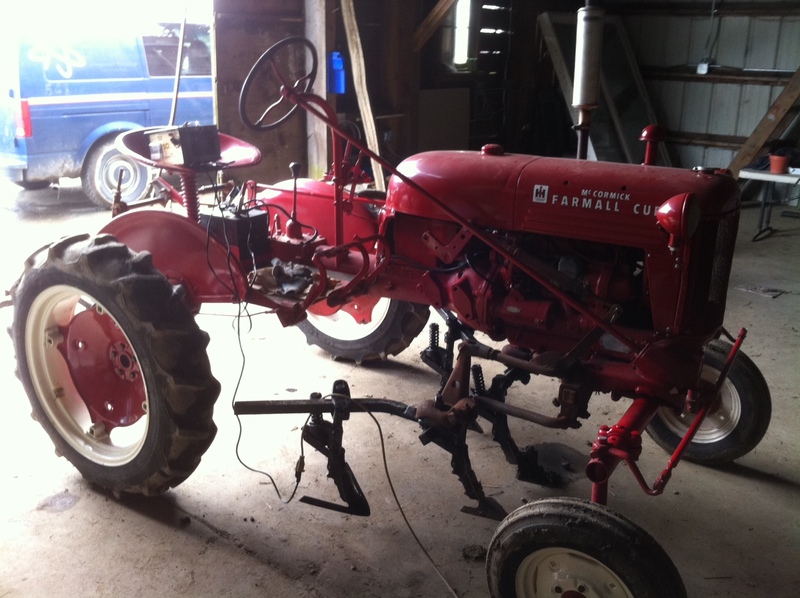 A Farmall Cub is a really neat, eleven horsepower tractor designed for seeding and cultivating small acreages. 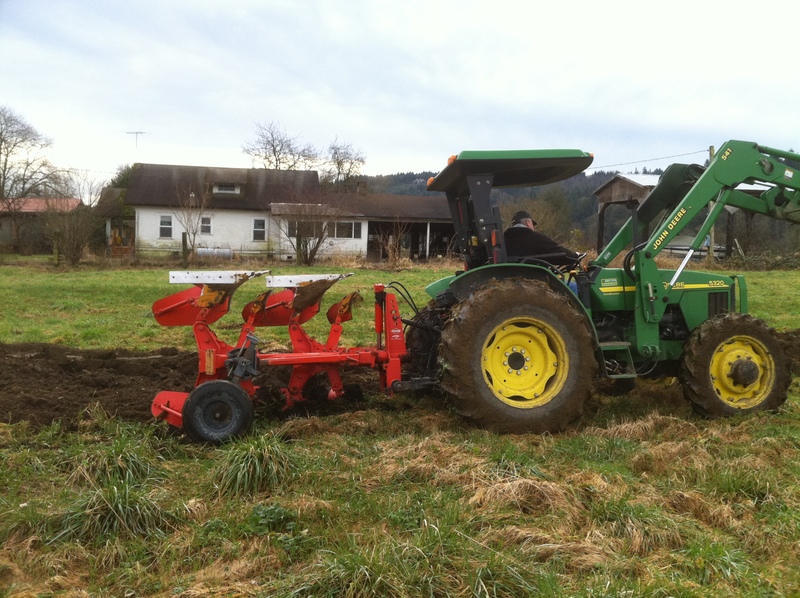 The engine and driver’s seat are offset to the left so the driver can watch the cultivating knives kill weeds (the black dart-shaped things under the tractor) as they pass by rows of vegetables. We bought our Cub last month, but until yesterday it was being worked on by a neighbor, who was helping us figure out how to mount our fancy new Jang seeders to it. Initially, I wanted to put them in front of the driver so he or she could watch the mechanisms on the seeder to make sure everything was working properly. However, the seeders are too tall to easily fit under the tractor. So we opted for the significantly easier rear-hydraulic mounting system. As it turns out, all the finicky parts we felt we needed to keep an eye on when we were seeding with Planet Jr. seeders aren’t visible on the Jang anyway. And mounting the seeders behind the tractor will make it way easier to change seeds. We also had a new used field disc delivered, which we’ll use to level recently plowed fields to prepare them for the year’s first seeding. We’re going to start with garlic, field peas, turnips, and radishes. We have also seeded (in seedling trays we keep warm in the greenhouse) over 50 flats of vegetables, including onions, shallots, kale, chard, lettuce, and tomatoes. Speaking of plowing, as I just mentioned, we had a neighbor plow two acres when we got a lucky weather window at the end of January. We are hoping that the predicted dry weather this weekend will allow us to have another four-five acres plowed. and helped us put the plastic up on greenhouse #2 this morning. Hey, theres a baby in that bed marker! You guys are making amazing progress, both with the farm and the new addition to the family! Thanks for sharing the details and great photos.